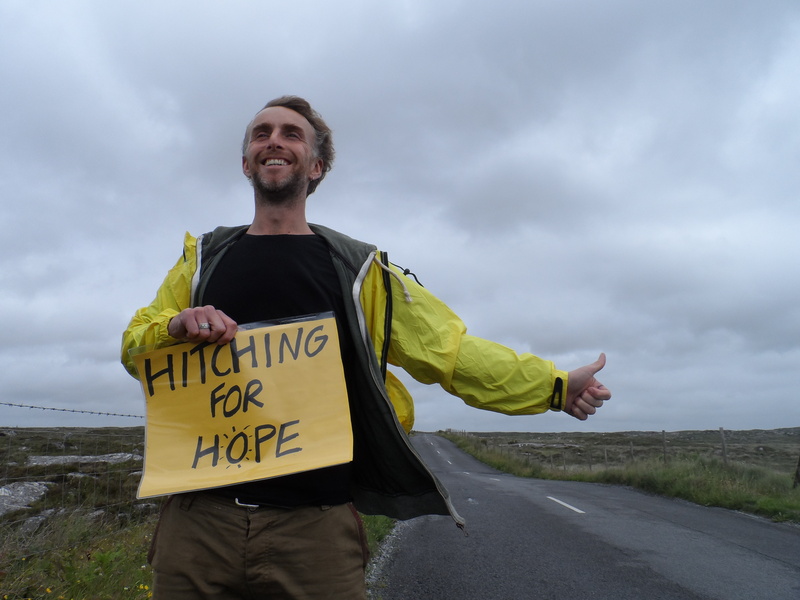 I am hitch-hiking around Ireland on a ‘Hitching for hope national listening tour’ in order to hear the voices and visions of the people of Ireland before speaking at the MacGill Summer School on July 30th. Starting out in Galway and taking in the four provinces, I am relying on lifts, meals, offers of campgrounds and places to stay, as well as online donations, to make possible this effort at listening to different voices and visions that badly need to be heard. I will be making audio and video recordings as I travel around the island of Ireland and will be posting updates on the ‘hitching for hope’ Facebook page, on Twitter, and on a new blog at www.community.ie. I also intend doing phone-ins to radio shows and updating listeners as I go. The idea came about because I didn’t want to just go to MacGill and lecture people about my vision for Ireland. I think it is important to start listening to people and finding new ways of progressing the national debate on what a new dream for Ireland might look like. I considered doing an online consultation but decided that it was better to try and get out there and meet people where they are at. I used to hitch-hike a lot when I was younger, and I know hitching is a dying transport option, but I think it’s still an excellent way of meeting people, opening up conversations, and finding ideas for where to go next. I’m hopeful the goodwill of people will carry me through as many of the 32 counties as possible.” he said as he set off on route West from Galway. I’ve already been inundated with offers of places to stay and recommendations of places and groups to visit and people to talk to. Friends, family, colleagues and complete strangers have also been donating to me online and I’m genuinely humbled and encouraged by the support I’m getting. It has given me a strong sense that this trip will be an important learning journey for me and one that will hopefully serve the national debate in some meaningful way. This is a transformative moment in Irish history and I think there are plenty of people out there that aren’t being heard who need to be heard. There has been too much talk, not enough listening, and certainly not enough action. I am looking forward to connecting with the ideas, solutions and visions that people of all walks of life have for this great country of ours and to helping find new ways to make these voices heard.